Friends, we live in an incredibly photogenic city. The sunsets here—perfect. The entire sparkling expanse of the city at night—magic. And nowhere is that more apparent than in the images captured by these L.A. photographers. This guy, Esteban Jimenez, does aerial tours of L.A. for photographers like Erwin Chow, who took the above photo (more of his stuff in a sec). This feed is a steady stream of excellent shots of local landmarks in killer golden hour light. Ayyy, remember this guy from literally two sentences ago? Long Beach photographer Erwin Chow spends a lot of time putting around the airspace with @copterpilot, and his Instagram is more of the same. And by more of the same, I mean more can’t-get-enough-of-it gorgeous photos of the city. Esteban Rey Jiménez often taps into that broody visual tone that made Nightcrawler exemplary, and every shot is worth both double-tapping and lingering over for 1.46 seconds longer than usual before scrolling on to photos of your sister-in-law’s new Border Collie. Prepare to be floored—this guy is a master. Nuff said. 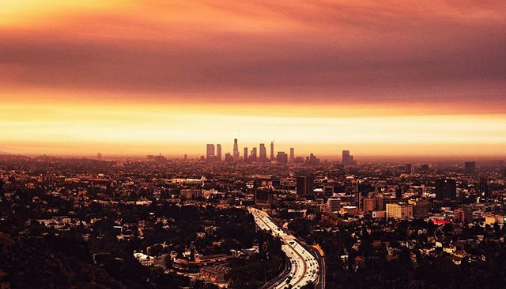 Dylan Schwartz’s incredible shots of L.A. will remind you that, hey, we live in a vacation destination. For indulgently bold and contrasty pics of the city at dusk, look no further. This stuff is candy. The port is especially photogenic with all those colorful shipping containers, the Vincent Thomas Bridge (for sure the city’s best bridge now that 6th Street Bridge is gone), and the sci-fi cranes and machinery. The @portofla account is run by the actual Port of L.A., aggregating pics from standout photographers (like the one above from Dylan Schwartz). Hot damn those primary colors pop. (And secondary colors. There’s secondary colors in there too.) Follow Beau Ryan for pure neon-lit luxury (and also some really nice portraiture). Everyone will always sorta resent Scott Reyes for nabbing the @losangeles handle, but he deserves it. The guy’s an urban explorer with a knack for capturing L.A. at its most quintessential. His other account, @4thandspring, is equally worth a follow. Stuart Palley has been chasing SoCal wildfires since 2013, and the photos he captures are awe inspiring and terrifying at the same time. With the highest follower count on this list, Cole Younger is an IG powerhouse. He’s so good that P. Diddy stole one of his images and posted it as his own, which is 20 percent the sincerest form of flattery and 80 percent a total jerk move. The undisputed meritocratic ruler of L.A.-centric Insta accounts, @conquer_la hosts roving street photography meetups and aggregates pics by incredible photographers (like @831gaberodriguez above). Scrolling through this feed plays like a highlights reel of the city. If you only come away from this list following one account, make it this one. It’s the best of the best, and it’ll introduce you to photographers who didn’t make this article—not for lack of skill, but because lists like this are limited and ultimately kinda arbitrary. There’s so much more out there to discover. Treat this as your jumping off point.